Last week, my parent’s and my brother came to visit us, and it was so nice having them here. And it was even nicer being able to bake with my mom in our kitchen. One morning, my mom and I decided to make her delicious Cherry Peach Turnovers. We headed to Walmart to shop for all the ingredients to make these delicious turnovers, I love that Walmart Produce is fresh, farmer picked produce with a 100% money back guarantee. Once we got to Walmart, we noticed a huge pile of fresh peaches and a ton of bags of sweet cherries displayed in their produce section. 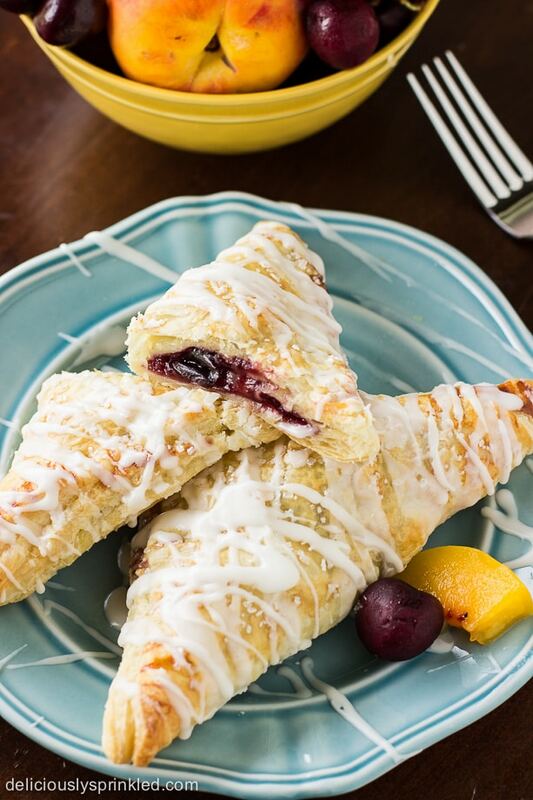 It was like they knew we were coming (or it’s peach and cherry season)…either way it made me super excited to make these turnovers with my mom. 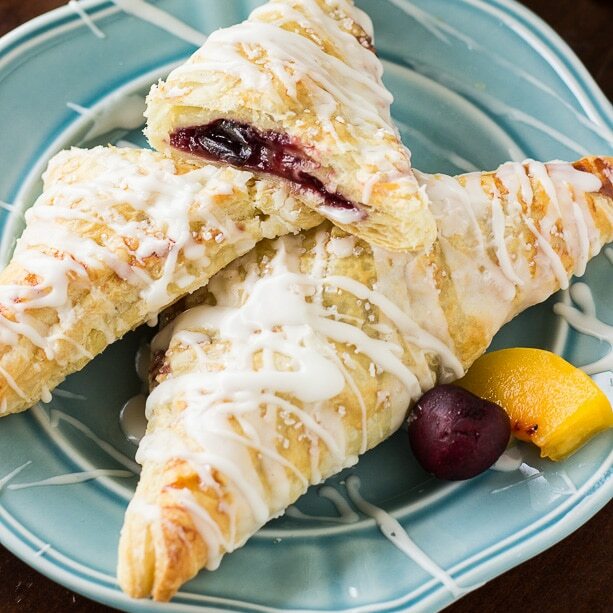 These turnovers are super simple to make, all you need is puff pastry dough, fresh peaches and fresh sweet cherries to make the filling. Bake them up, which only takes about 15 minutes and drizzle them with a generous amount of vanilla glaze. My mom and I couldn’t wait for the guys to come home from their early morning round of golf to enjoy these delicious turnovers. They were a huge hit and made for a great start to a fun day with the family! Preheat oven to 400F degrees. Line a large baking sheet with parchment paper or a silicone baking mat. Carefully, roll out puff pastry dough onto prepared baking sheet. Using a pizza cutter or knife, cut puff pastry dough into 4 equal squares (see step-by-step image above). Set aside. Place the butter, peaches, cherries, brown sugar, and cornstarch in a saucepan over medium heat. Stir until filling because thick, remove from hear and stir in vanilla extract. Spoon (about 2 tablespoons) of filling onto the corner of each puff pastry square. Fold opposite side of pastry dough over, using a fork to seal the ends ( see step-by-step image above). Brush egg white wash on top of each puff pastry and sprinkle with coarse sugar. Bake for 15 minutes or until tops of turnovers are lightly brown. Let cool for 5 minutes. In a small bowl, mix powdered sugar, heavy whipping cream, and clear vanilla extract together until a light, creamy glaze forms. 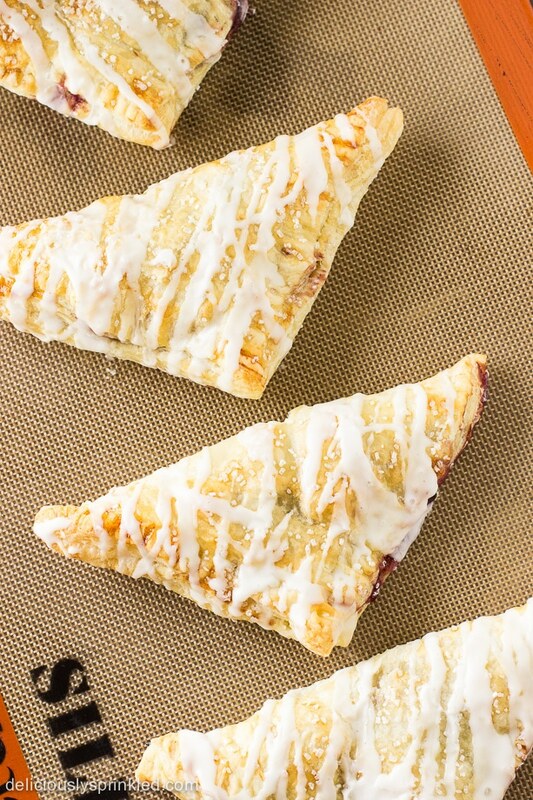 Drizzle on top of cooled turnovers right before you are ready to serve them. Enjoy! These look amazing. Girl, I love your new site. It looks fabulous! It totally screams Jenn. Holy moly I am loving this recipe! Yum! These look so good! And they’re gorgeous, too! i am so definitely craving one of these turnovers right now.. they look delicious! Totally craving these right now – they look amazing! Love how easy these are to make! Perfect way to enjoy fresh fruit! I’m a huge turnover fan! these look delicious and your step by step is perfect! !